They exist in many English towns, allotments—small plots of land separated by fences, set aside for local people to grow plants. Usually located on council property with an accessible water supply, they rent for £20-£25 ($40-$50) a year. Allotments are primarily used for growing vegetables, but some choose to raise ducks and chickens, and several plots can be combined into horse pastures. Though some allotments are immaculate, the majority seem to have a personality all their own, with rickety sheds and barely-standing greenhouses. 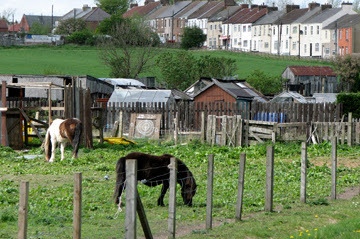 The photo above, from nearby Meadowfield, shows the best relation of an allotment to a town, and the range of allotment uses. A friend suggests one of these would make a strategic private office for Ben. Brilliant! Out in nature... Healthy snacks all around... Free pony rides... Oh, here. I’ve found just the spot. Comes with free courier service. His house is around the corner from the allotments,* not far from the hungry chickens, near the start of our daily walk. He sits opposite his living room window keeping one eye on the street and one on the telly. 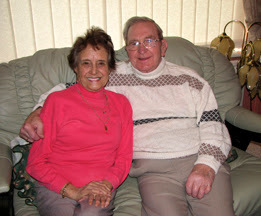 Eighty-four-year-old Benny is housebound by a stroke that stole his mobility but not his spirit. It’s quiet on his street, interrupted only by the occasional clucking of the horse-drawn carriage that comes and goes out of the last century. Or the tapping on the black-and-gray car in perpetual repair two drives down. Or children returning home from school. In the summer he can hear the young ones play in their inflatable pool, teenagers on Heelys** and mobile phones, the football games on the green nearby. Comforting, neighborly sounds. But once daily, year-round, an audible assault violates our peace from the far end of town, slowly, deliberately invades our neighborhoods in pseudo-cheer. His name is Mr. Whippy. The ice cream van. Themes from old cartoons and WWII jingles blare out-of-tune in full volume on infinite repeat. Songs that annoyingly linger long after the van and its performance disappear. Today, it’s raining. 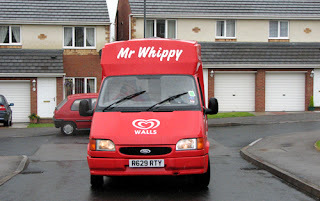 The ice cream van comes driving exuberantly into our street playing Raindrops Keep Falling on my Head. This is not amusing. Benny sits inside watching the world go by without complaint. “Cowboy films,” he says, “I like them.” And he never misses a thing that goes on outside the square confines of his living room window. Every day we wave as we walk by, and with a big grin he waves eagerly back. Vera is Benny’s best friend. Benny can barely walk, but drives an immaculate Fiat Punto and visits Vera’s on the days she makes broth. Benny loves broth. Vera lives in the next village. She’s tiny, raspy, animated, and does all the talking when they’re together. One day when Vera was visiting Benny, I popped in to say hello. “She’s got cancer!” Benny blurted without greeting. “In my woooomb,” she echoed. 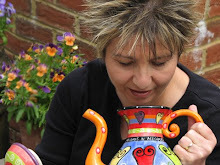 Vera’s pre-op tests were scheduled at the end of December, on her 70th birthday. By the new year her womb was gone. That was Vera’s last real meal. Two days later she was in excruciating pain. And every treatment did her in a little bit more. “She’s drugged and she sleeps all the time. I just go and sit with her,” he said. Today, as Benny reports on Vera’s welfare, a Western is playing on TV, mute. He sits on in his cream-colored sofa clutching the remote, and waves it around to emphasize his points. His arms make up for the legs he can barely move. He loves to tell tales of old times when he worked in the local mines. How at 19 an entire load of coal tipped over him and he was left for dead. What the neighborhood looked like back then. How the very first time he cast eyes on his (future wife) Nan, she was painting stockings on her legs. **** How Nan had sworn she’d never marry a “pit boy.” And how, after many happy years together, her life abruptly ended when she got gangrene due to a physician's medical negligence. On the mantel to Benny's left stands an old-fashioned bone-china boot painted with delicate flowers, an ornament left by Nan, the picture of health, who passed away from that sudden illness and left Benny alone the past ten years. Next to the china boot a copper bell sits in symbolic silence. In the center, a miniature pendulum clock trapped in a glass case ticks Greenwich Meantime, but the pendulum’s immobile. I look at Benny stuck in his chair, alone, staring out the window, suspended in time, waving his arms as he talks but never complains. He says Vera hasn’t eaten in weeks. His voice is alarmed, desperate. By the end of April Vera is back in surgery having more cancer removed from her body. Two days later she is scheduled for chemo to treat the first cancer. But she’s too fragile to go through it. Benny and Steven, Vera’s son, bring her back to her house and tuck her in. She’s on morphine now, and in constant pain. “She’s poorly,*****” Benny says shaking his head softly. He phones twice a day to check on her. She’s too weak to talk. Within three days she is gone. Benny orders the biggest heart of blooms to go on Vera’s tiny casket. *Allotments are small plots of land people rent to grow vegetables, turn them into chicken coops, or combine several into horse pastures. All these scenarios exist in the allotments between our development and Benny’s house. **Heelys are shoes with wheels inside the sole. You can roll, walk or run on Heelys. ***Canny means nice. It can describe the way someone feels, a person’s looks, the way a car runs... even the weather can be canny. ****In 1943, during the war, silk stockings were in short supply. It was considered rude for women to go around bare legged but the government had forbidden employers to make women wear stockings. So many girls painted their legs with makeup and drew a line down the back to look like a seam. *****Poorly, in short, means unwell. However the word is never used in conjunction with the state of being, such as, “I’m feeling poorly,” but simply, “I’m poorly” (pronounced “poolie”).